LessThanDot - SQL Saturday #119 Chicago 2012: They Did It. Again. SQL Saturday #119 Chicago 2012: They Did It. Again. This is the third year I’ve headed south to Chicago for SQL Saturday. The first, in 2010, was my first SQL Saturday ever. The second, in 2011, was the first time I ever spoke at a SQL Saturday. Could it get better this year? It could, and it did! Earlier this year, my friend Aaron Lowe (b | t) had an idea for an event – get a group of SQL people together for networking. Isn’t that always the best part of events? He created SQLFriends, and held the first lunch in March. The second was on Friday, and the guest host was LessThanDot’s own Ted Krueger (b | t). The point is to get people in a room, with no session or agenda, to network and talk. And talk we did. There were a dozen people, from at least four states; from consultants with decades of experience to a student graduating later this month. We talked about consulting, writing books, running (I was there, after all), SQL features, and more. It was fun and inspiring. It allowed me to get to know several people better. Ted was a great host, sharing stories and advice. The only time we really got quiet was when he was telling us about a bug he discovered with SQL Server Replication. Yes, we’re geeks. Thank you, Aaron, for putting this event together. He’s looking to spread this idea, so if you have a great location and a possible guest host, let him know! The main event took place on…wait for it…Saturday. We were at DeVry University, the same location as last year, which is a great location. I grabbed some Dunkin’ Donuts coffee and a bagel and went to the sponsor room. That was set up really well, and I got a chance to chat with the national and local companies supporting the SQL community. Thank you to the sponsors! I caught part of the WIT lunch session, between waiting in a long line for Portillo’s and dashing off to present. Thank you to Wendy Pastrick, Erin Stellato, Hope Foley, and Shelly Noll for sharing their experiences and advice! I presented my “Reporting Services: From Basic to WOW!” session after lunch. I always like the challenge of keeping people awake after a good lunch (and Portillo’s was a good lunch). I had a packed, energetic room that I really had a great time presenting to. 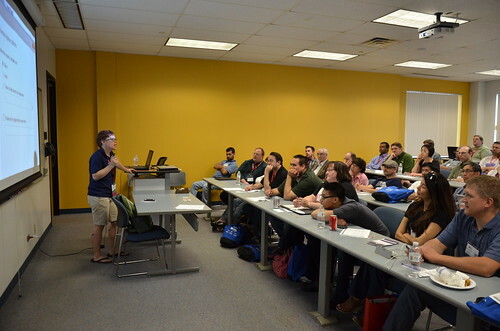 About half the attendees were at their very first SQL Saturday, which was exciting for me. I talked about my favorite report and tablix properties. I showed how to create a matrix. I asked how many people had used lists, one of my favorite features, and was surprised to only see three hands go up; I showed everyone how powerful they can be. I finished the session up with a quick look at charts. Reporting Services is so fun, and I love sharing how many things you can do with it. It is so much more than just black and white tables of numbers to be exported to Excel. You can download the PowerPoint and .rdl files from the SQL Saturday website. There was something new at SQL Saturday Chicago this year. 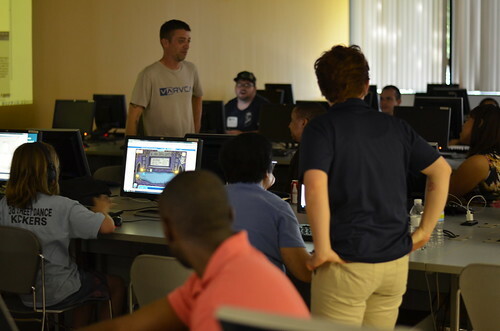 The organizers worked with DeVry to offer a free SQL Server class to alumni and students. The topics covered were installing SQL Server; a look at SSRS, SSIS, and SSAS; and creating your first database and table. I was asked to lead the SSRS portion, and assisted Ted and Frank Gill (b | t) with the other labs. It was exciting and challenging to share real-world knowledge with people just getting started in the field. I have to commend Ted and Frank for putting together the presentations and labs from scratch, and keeping the students interested on a beautiful Saturday afternoon. I think this would be a great way for other SQL Saturday organizers to give back to their local community. I know it’s a lot of work and coordination, but I think there’s a lot of value. What happens at #sqlkaraoke stays at #sqlkaraoke. If you go to a SQL Saturday and there is an after party hosted, try to go. It’s nice to get to know people outside of a classroom. As always, my favorite part of the weekend was all the people. I got to see many old friends, and met some new ones. The people are what make this community awesome. Chicago, I’ll see you again next year!